This site doesn’t normally do announcements about upcoming shows, as you will know if you have visited it before. But sometimes I like to put up information about a show that promises great things or is by artists who are really significant in the scene. Here’s some info about a show that starts May 16th that will deliver or both fronts. 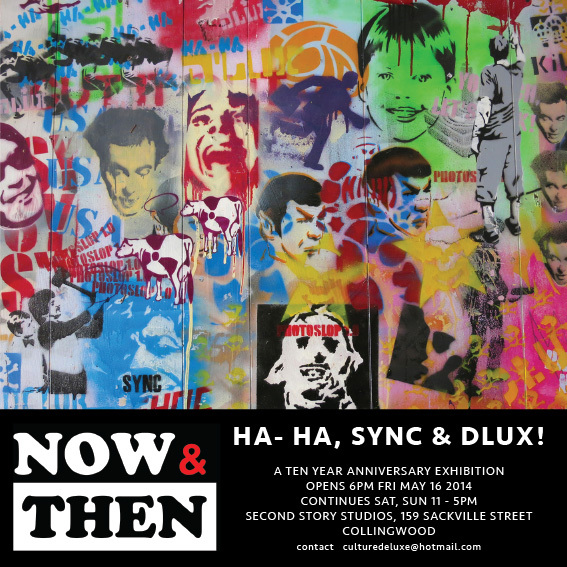 If, like me, you have been following the graffiti and street art scenes in Melbourne for a long time, you will be thrilled to hear about an upcoming exhibition that celebrates the history and longevity of some of Melbourne’s most significant artists of the last decade – Ha-Ha, Sync and DLux. These were the names that helped to put Melbourne on the global map of significant street art centres. All three are still in the art game, and it’s fantastic that there is a show celebrating both the old times, and the new times, for these artists – and for Melbourne’s art.